I have always thought highly of Bryn Williams. That man can cook, and I thoroughly enjoyed my meal the last time I went to Odette’s even though I had a bit of a bad service experience (click here for that post). But the food at Odette’s was good enough, and it deserved another chance. 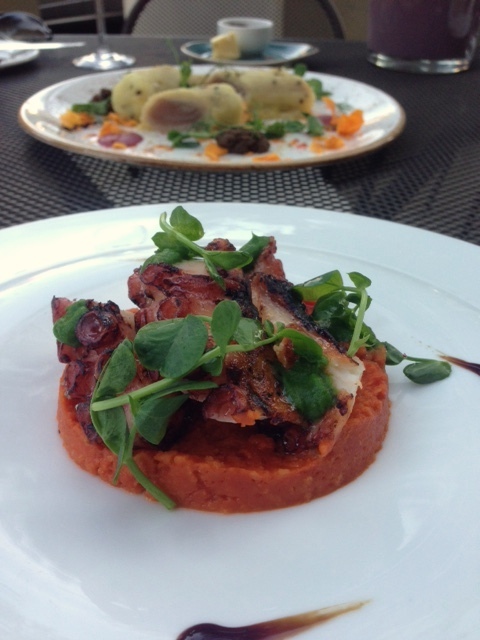 This time around I dined as a guest of Odette’s. We kicked off the meal with an amuse of mushroom soup with pickled mushrooms. The soup was wonderfully flavoursome and creamy, and the pickled effect of the diced mushroom pieces gave the soup an interesting contrast. Succulent, moist and perfectly crisped hand dived scallops (£14) were accompanied by some velvety smooth cauliflower and coconut purée that worked well with the star ingredient and which left me wanting more. 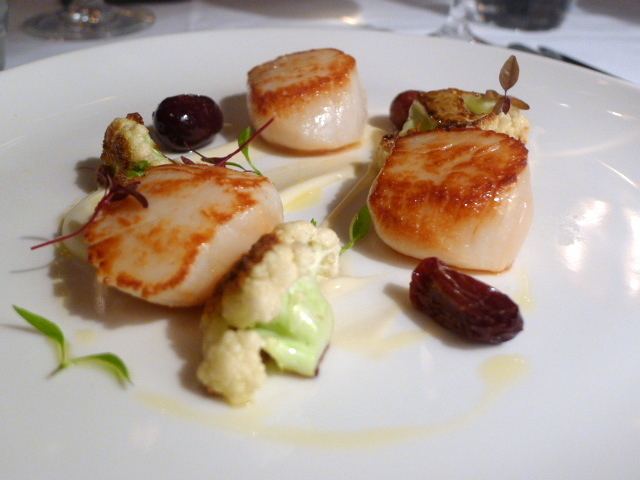 There were also some salted grapes which weren’t particularly salty but which didn’t quite match with the scallops. Nevertheless, this was a very classy and accomplished dish. I am a big fan of Atari-ya on James Street. The sushi is super fresh which is to be expected of a business that imports premium grade sashimi fish and supplies high end restaurants such as Nobu and Zuma. Prices at the James Street branch were very reasonable when I last went, especially given the quality. And its proximity to Oxford Street means that it’s an easy diversion when one is out on a shopping expedition. Atari-ya seems to be branching out. Earlier this year they took over Sushi-Hiro in Ealing Common. There’s now a branch in Swiss Cottage as well which is where I recently visited. 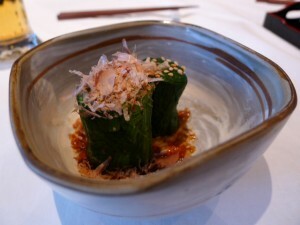 Ohitashi (boiled spinach – £3.50) was topped with bonito flakes and finished with a lovely sauce of dashi and soya sauce. Last week I was lucky enough to be invited to a preview evening at the new Waitrose cookery where we were treated to a macaroon masterclass. The school opened this Monday and is situated above the Waitrose John Barnes branch on Finchley Road. 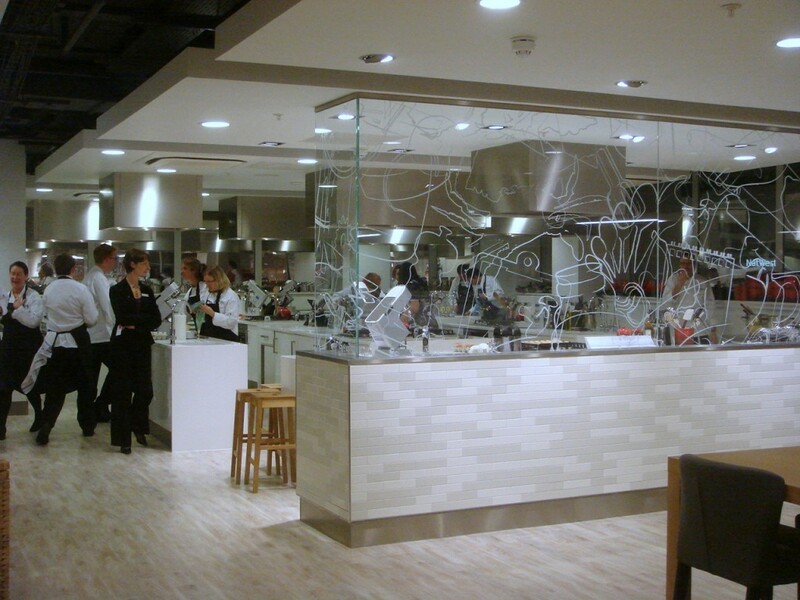 The cookery school is state of the art. No expense was spared to fit it out and it has those sleek white lines that are the trademark look of all the Waitrose supermarkets. I was very impressed. It’s spacious and comfortable and far classier than my days spent in the kitchens at Westminster Kingsway Cookery College. Note: This restaurant has now been acquired by Faucet Inn Pub Group. When Gordon Ramsay took over the freehold of The Warrington and launched a gastropub there in February 2008, I lamented the lost of Ben’s Thai Restaurant. Ben’s Thai was situated on the first floor, above the pub (which is where the gastropub is now), and although it was far from perfect, it had personality. Its off-the-wall décor fit in with the quirky charm of the pub below – a lavishly decorated outfit with art nouveau stained glass windows, carved wood works and a marble topped mahogany bar. For added character, it was rumoured that the building was once used as a brothel. But under Gordon Ramsay, the gastropub, aptly named The Warrington, became cool, stark and a little austere. When I first went there for dinner soon after its opening, it was hard to reconcile the sleek, new dining area with the pub below that was bursting with old world charm. Other than this oddity, I remembered the food being pretty decent. For about the last three years, the dim sum kitchen at Alisan in Wembley has been run by two ex-Hakksan dim sum chefs, Bao Chen and Seng Chow. 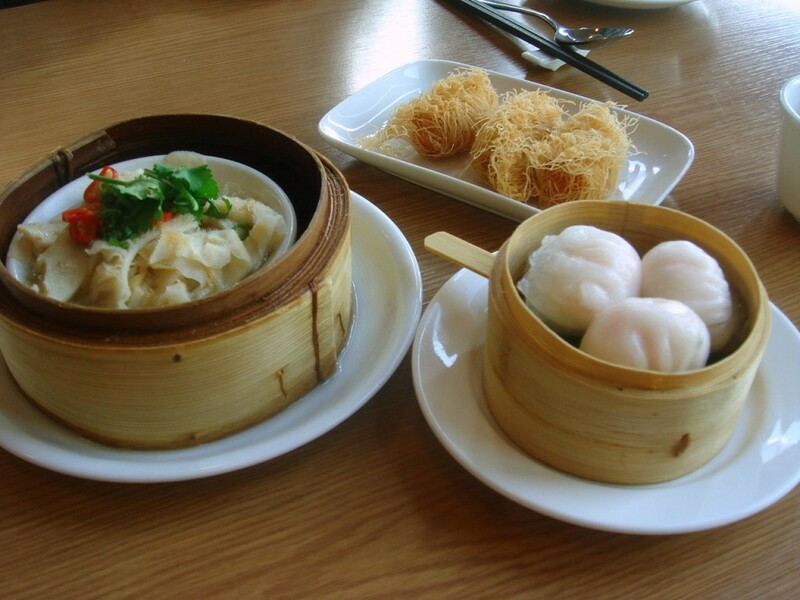 Consequently, in 2007, the restaurant became a finalist in the best dim sum dish category as awarded by the Craft Guild of Chefs and Restaurant Magazine. So despite its Wembley location – which entailed three tube changes – I just couldn’t resist going to see just how good the dim sum at Alisan might actually be. The restaurant is spacious and airy with lots of natural light. But with Wembley stadium in view, it’s hardly the most glamorous location. The surroundings feel a little like an industrial site, and the walk from the tube wasn’t the most exciting. But it’s the food that counts, and we started with a perennial favourite, har gau (prawn dumplings) (£2.80). The prawn filling was wonderfully crunchy and tasty and possessed a strong aroma of sesame oil. The wrapper was nicely done but could have been a little lighter in texture. Odette’s Restaurant has become something of an institution in Primrose Hill since it opened in 1978. In 2006, Bryn Williams took over as the head chef, and went on to become the owner in October 2008, when he purchased the restaurant from music mogul Vince Power. 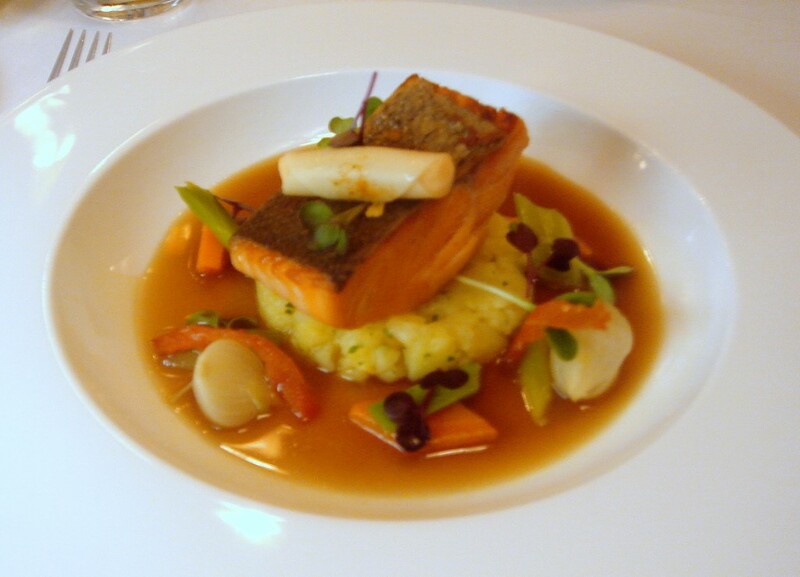 Having previously worked at Le Gavroche, The Orrery and Galvin at Windows, Bryn gained further recognition in 2006 on the television programme, The Great British Menu, by winning the fish course, and consequently the opportunity to cook the dish for The Queen at her 80th birthday banquet. Therefore it was with great curiosity that JK (and that’s not Rowling) and I ventured to Odette’s. Having met up for a drink before dinner, we set off to the restaurant in two separate cars. And what a journey that turned out to be. As she thought she knew the way, I decided to follow her. But as it turned out, she didn’t really know the way. Furthermore, her road handling is of the kind that belongs more on a race track than on the speed bumps that lead to Primrose Hill. In contrast, I am rather slow in my little car. And alas, it was not long before we became separated.